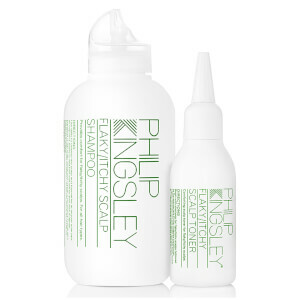 Philip Kingsley's Flaky/Itchy Scalp 8-Day Kit is an intensive regime to help relieve flaky, itchy scalps. The nourishing treatment is enriched with anti-fungal Piroctone Olamine and Salicylic Acid to gently sweep away dandruff and impurities whilst replenishing deep hydration to ease itchiness. Antioxidant Green Tea Extract defends against environmental aggressors to promote a calm, comfortable and healthy scalp environment. Soothes and calms sensitive scalp. Enriched with an anti-microbial and anti-flaking formula, it gives immediate and long-lasting relief from irritation. Clear and odourless, it's safe to use on colour-treated hair. Mask: Dampen the entire scalp and hair. Apply the formula from the tube nozzle directly to the scalp in partings approx. 1” (3cm) apart, working from the front of head to the back. Using your finger gently spread the formula down the parted hair line on to the scalp and leave to absorb for 10-20 minutes. Whilst your scalp mask is working, apply Elasticizer to mid-lengths and ends for an extra hair treat. The mask should be used once a week, on days 1 and 8 and one tube is adequate for a full scalp application. 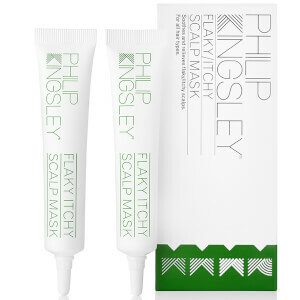 Shampoo: After 10-20 minutes, rinse the mask from the scalp and follow with a double shampoo using Philip Kingsley Flaky/Itchy Shampoo. First shampoo and gently massage for one minute to lift and remove loose flakes. Rinse and shampoo again. 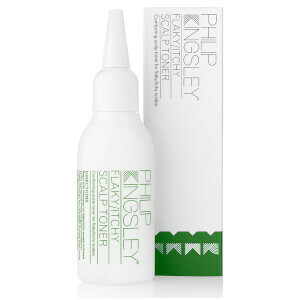 Condition hair using the appropriate Philip Kingsley conditioner for your hair type. Flaky/Itchy shampoo should be used daily for maximum benefit. Toner: Next, lightly towel dry hair and apply Flaky/Itchy Toner to the scalp directly from nozzle in 1” (3cm) sections. Distribute with fingertips. Do not rinse. Comb through and style. Flaky/Itchy Scalp Toner should be used daily on a dry or damp scalp for maximum benefit. It can also be used as frequently as required throughout the day to calm and soothe the scalp. Mask: Aqua (Water), Coco-Caprylate, Glycerin, Shea Butter Ethyl Esters, Sodium Hydroxide, Hydroxyethyl Acrylate/Sodium Acryloyldimethyl Taurate Copolymer, Caprylic/Capric Triglyceride, Squalene, Acrylates/C10-30 Alkyl Acrylate Crosspolymer, Salicylic Acid, Lactic Acid, Polysorbate 60, Disodium EDTA, Sorbitan Isostearate, Epilobium Angustifolium Flower/Leaf/Stem Extract, Hydrolyzed Hyaluronic Acid, Camellia Sinensis (Tea) Leaf Extract, Pyrus Malus (Apple) Fruit Extract, Sodium Metabisulfite, Apium Graveolens (Celery) Seed Extract, Tocopherol, Citric Acid, Benzoic Acid, Benzyl Alcohol, Piroctone Olamine, Dehydroacetic Acid, Phenoxyethanol, Potassium Sorbate, Sodium Benzoate. Toner: Aqua (Water), Alcohol Denat., Camphor, Polysorbate 20, Piroctoe Olamine, Benzalkonium Chloride.